Got an extra $3700 lying around the house and a few extra trees. That is all you need to get started in milling your own lumber. The LT10G7 from Wood-Mizer is a compact manual push sawmill that is ideal for the hobby woodworker that wants to cut out the middle man (pun intended). 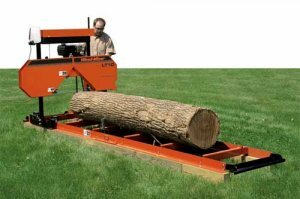 Powered by a 7 HP gas engine, the LT10GT can cut up to 100 board feet an hour at a maximum log diameter of 24" and 11' long. If 11' isn't long enough for you, you can purchase additional 7' bed extensions to your hearts content. Got some really big trees? You can always step up to a larger trailer mounted version, and take your milling business on the road.